Stream your iTunes music library to your iPhone or iPad from Windows over WiFi and 4G! Stream audio, video, music, documents and photo files from anywhere using your iPad, iPhone or iPod Touch. What's New? 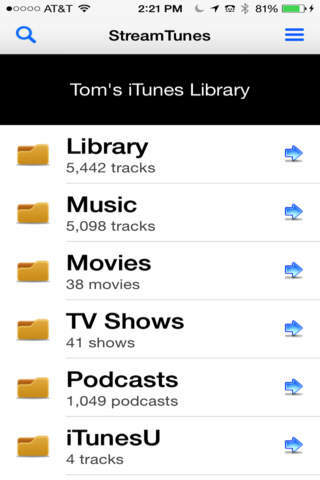 Shuffle, search filters, continuous play and advanced caching of songs and artwork. New easy server configuration for opening ports. Use shuffle mode to randomly playing through a playlist. Can also shake the device to do a shuffle. Shaking the device while the main playlists are displayed will select your Music Playlist and do a Shuffle. This app has a 2.0 star rating (51 ratings). It occupies the 438889th position in our ranking with 47 points. It is among the 25% best ones of its category and among the 25% best ones of the overall top. Other apps from MarkelSoft, Inc.
iMyAddress - Display your current address anywhere. mText2Speech - Translate instantly between languages, Speak and Share!